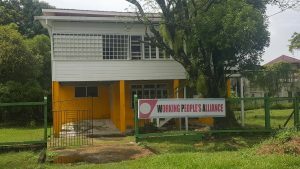 The headquarters of the Working People’s Alliance (WPA) on New Garden Street, Queenstown, Georgetown. Working People’s Alliance (WPA) executive member, David Hinds says his party is better inside the governing coalition, but at the same time should consider leaving because it is not having a say in shaping government policies. “This is not just a WPA matter, but a national one. My personal view is that if our exclusion from influencing and framing government policy continues, then we should not be there,” he said. Hinds told Demerara Waves Online News that he was sure that the future of his party in A Partnership for National Unity and the coalition government would be placed on the agenda of his party’s next executive meeting. No date has been set for that meeting, and he added that he would make a case for the concerns to be discussed at the leadership level, among the wider membership in Guyana and overseas, including founder-members and where possible in the wider society.. He acknowledged that the coalition is stronger than the individual parties and “we could only win when we are together” but the absence of consultation is worrisome. “Where we seem to disagree is on how the Coalition should function when in government. The WPA firmly believes that the Coalition is good for Guyana, but we also believe that a Coalition in which there is limited intra-coalition consultation and no meaningful role for the coalition parties in influencing broad policy is bad for Guyana,” he said. General Secretary of the People’s National Congress Reform (PNCR), the largest political party in the governing coalition, has already expressed doubt that the WPA would leave the coalition and APNU. President David Granger has denied that the WPA has been side-lined. Reacting to fellow WPA Executive Member, Dr. Rupert Roopnaraine’s view that the rest of the executive would have a hard time convincing him why their party should walk away from APNU and the almost three-year old coalition administration, Hinds indicated that the burden of that question would be on Roopnaraine. “I am sure many members share Dr. Roopnarine’s view that we are better inside than outside. So that’s not the issue–the pivotal question is what are the conditions under which we will remain in the government? Dr. Roopnarine and others would have to convince many of us why we should remain in the government under the current conditions.” Hinds said. Roopnaraine, who is not as active as before because of poor health, is the lone WPA government minister. He is now the Minister of Public Service, having been shifted from the Ministry of Education. The United States-based Political Science Professor accused APNU of sidelining the WPA from having a say in the crafting of policies that would then be implemented by Cabinet. Giving the WPA a Ministry and a few positions is not enough–the party must influence policies. And we have the capacity as a party to do that. If we were good enough to help shape the vision and the message to bring victory in 2011 and 2015, then we are good enough to help to govern after 2015,” he said. Hinds said his party helped to frame APNU and coalition’s vision and manifestos, not as WPA but as a partnership and coalition as part of the coalition. “WPA worked as hard as any party to bring the government to power; we put our cherished reputation on the line when we joined with the PNC to form the APNU and with the AFC to form the coalition,” he said. In its heyday in the 1970s and 1980s when it had advocated the removal of the PNC-led dictatorship of then Forbes Burnham by any means necessary in a civil rebellion, its iconic leader, Dr. Walter Rodney was killed in a bomb-in-walkie-talkie explosion. Two other key WPA figures- Ohene Koama and Edward Dublin- were also gunned down in that period. The WPA executive member argued for his party to “help to govern in meaningful ways”, having helped to frame the vision and the manifesto as well as convince the electorate from the platform, in the media and on the ground to vote for them. “This has not been the case. All we ask is to be treated as a legitimate partner –we are not in the government as window dressing. We, the WPA and APNU, are fooling the nation by giving the impression that we help to govern when we are not. WPA is daily eroding its noble tradition and special place in Guyana’s political history by continuing this charade,” he added. Hinds and trade unionist , Lincoln Lewis were recently booted out of the state-owned Guyana Chronicle as columnists after months of growing discomfort by sections of the governing political executive that their writings in that government-controlled publication were knocking the Granger-led administration too hard. The President is on record as saying that he does not attack his coalition partners.